We have had a wonderful time in Sydney and our last full day has been no exception. While the weather did turn somewhat colder there was no way that it would dampen our spirits as we made our way to Luna Park. After a short walk over the Harbour Bridge we came to the iconic entrance. After the distribution of the unlimited rides passes, the girls made there way through the mouth and back in time to the joys of yesteryear. It also had a similar youthful effect on the teachers. For our final night in Sydney we will once again make our way to the Opera House but this time to see the Sydney Symphony Orchestra. We will be listening to English and French music with a Piano Concerto by Ravel and an overture and symphony by English composers Arnold Bax and Ralph Vaughan Williams respectively. Following this we will make our final brisk walk back to the YHA. In our short time in Sydney we have managed to squeeze in many exciting experiences. It has been a wonderful week with so many memories made for each of us to enjoy over and over again. Posted in Music Tour 2016. Yesterday was a huge day to say the least. Starting with a 7am breakfast we then left the YHA and split into two groups; one walking to the Opera House and the other group to the Sydney Conservatorium of Music. At the Opera House we learnt about the history of the design and building of the now famous landmark and were shown through most of the iconic buildings 5 theatres. Of course it was also another opportunity to get some great touristy photos of the harbour and bridge. At the Conservatorium the girls participated in a gamelan workshop. This set of instruments provided a fascinating insight into the Balinese culture and the girls were able to show their musical skills by learning an entire piece in the 1.5 hour workshop. This was certainly a test of their concentration as everything had to be played from memory. After 3 days on tour, this was quite a challenge for some. Also at the Conservatorium we learnt about the history of the building and site. Starting as an indigenous meeting place it transformed into farming land and a bakery for convicts then to a stable for the governor’s horses and finally into the Conservatorium. To finish off the day, again we walked back to the YHA for dinner and got all dressed up in preparation for a trip to the opera. A first time for the majority of girls, there was an air of excitement. Although completely in French, we were still able to follow the story line through the subtitles and the drama through the music. Finally we were on our way back to the YHA for the final time with some girls setting a cracking pace for the walk. Perhaps they were cold? After a relaxed start to the day we took some time this morning to explore The Rocks having a look at some of the important historical buildings within the area. After this impromptu tour we boarded the bus to head to Darling Harbour for our final performance of the tour. We have been very fortunate with the weather and today was no exception which was especially important for our outdoors performance. A small but enthusiastic crowd gathered to hear the girls perform. It was lovely to see some familiar faces who followed us to Sydney but it was also a great experience for the girls to perform to a new audience with some extra challenges (hungry seagulls) thrown in. After our performance we made a quick change back at the hostel and departed for the amazing view from the top of the Sydney Tower. Due to the exceptional speed that the girls have now acquired from quick changes out of their uniform, we arrived somewhat early. The girls ably filled the extra time with a quick look around the shopping centre before heading up to level 5 of the Westfield building to then make our way a further 250 metres up to the observation deck. The views were truly amazing and gave us a great perspective of Sydney’s surrounds. Apart from the sights and experiences that we have encountered, one of the best parts of the tour truly has been the behaviour of our girls. Wherever we have gone we have had some wonderful feedback from members of the public. From airline staff to a member of the public travelling on a ferry and many others in between. All have been very forthcoming in their praise of the courtesy and manners that our girls have shown. They have certainly been a credit to their families and College. Tuesday morning we set off on a walk to the Sydney Town Hall. On the way, we indulged ourselves in a 20 minute retail therapy session which included Haigh’s Chocolates and Victoria’s Secret Perfume (which was a bargain!). When we finally got to the town hall, we were in awe of the amazing architecture but the best part was the hall’s magnificent organ. With over 9000 pipes ranging from 1 foot to 64 feet in length. We learnt about the history of the organ and enjoyed listening to all of the different sounds it can make. Afterwards, we rushed back to the YHA to get changed into our school uniform and headed towards Manly. We grabbed a quick bite to eat at the wharf and then headed to Stella Maris College. Here we had a combined rehearsal and then performed to their grade 7’s. Afterwards we made our way back to the wharf and caught the ferry to Circular Quay. It was a very windy trip with ribbons flying out of people’s hair. Now we are back at the YHA for a peaceful night gearing up for a big day tomorrow. After a slight delay with our flight, we landed in Sydney and made our way to the hostel. The girls quickly settled into their rooms but did not have much time before we needed to be back on the bus to head to St Mary’s Cathedral for Choral Mass. Once the obligatory group photo had been taken outside, inside it would have been very easy to mistakenly think that we were in a European cathedral. It was simply stunning and the choral mass only added to the mystique and majesty. Upon arriving back at the hostel we were well fed, settled in for the night and enjoyed the view from the rooftop terrace. 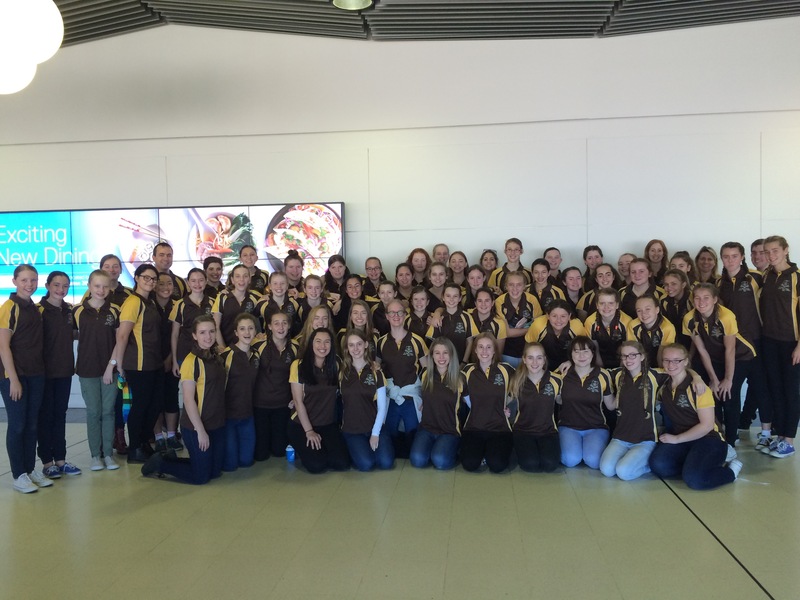 It was great to see all girls arrive at the airport this morning ready for a fantastic trip. How were they feeling? In a word, excited! It should be a great week. On Thursday the 63 students travelling on the first ever Music Tour to Sydney presented a performance for family and friends in Trinity Hall. The girls are definitely looking forward to spending a week in Sydney.